Earlier this year, Iranian authorities arrested Bahram Nasibov, Eldar Gurbanov and Yusif Farhadov for allegedly conducting missionary activity. In their first television interview hours after being released, the men told CBN News they knew the mission into Iran was risky. "We were expecting God to do something new for us on this trip, but we had no idea of the events that would transpire hours after we arrived," said 37-year-old Bahram Nasibov. On June 24, 2016, the three men from Azerbaijan, a country along Iran's northwestern border, set out to meet with Iranian Christians. The men left the Azerbaijani capital city of Baku and headed to the town of Astara, on the Iranian-Azerbaijani border. An hour or so later they were inside Iran. From the border area, they picked up a local taxi and drove about 300 miles south to the Iranian capital city of Tehran. Yusif Farhadov was in an apartment leading a Bible study when a sudden knock on the door caught them by surprise. "We opened the door and 20 to 25 men suddenly rushed into the apartment," Farhadov told CBN News. Eldar Gurbanov, 48, said he immediately knew they were in trouble. "When they burst into the apartment I knew right away that they were police officers, or government agents, because I've had similar experiences in Azerbaijan when authorities would raid our Christian meetings," said Gurbanov. After questioning, the government charged them with trying to convert Iranians to Christianity and sent the men to Evin Prison, Iran's most notorious jail. "The judge told us that we could spend 10 years in prison," said Nasibov. The next two months meant days of solitary confinement. A tiny, cold room. No windows. No bed. Just a sink. "Of course I had thoughts that I could spend the rest of my life in prison but I never regretted going to Iran." That's because in 2003, Nasibov says God posed a question to him from the book of Isaiah. "He asked 'Whom shall I send to the nations?' And I said, 'Here am I, send me'," replied Nasibov. "Since then I've tried not to miss an opportunity to go and preach the Gospel in other countries." 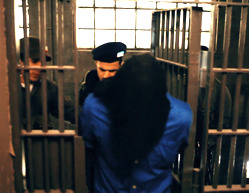 They were routinely interrogated and harassed, but Gurbanov said never lost hope. "The circumstances in the prison were very difficult so to stop it from affecting me emotionally and physically, I started praying, even singing aloud and the guards didn't even stop me!" Nor did they stop Farhadov from singing that well-known song, How Great is our God, in his native Azeri language. "I was singing this song so loud and I was not ashamed because I wanted to proclaim aloud the truth of the song." 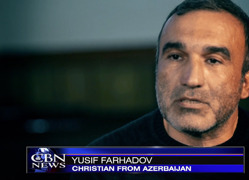 "We prayed with him, shared communion together and we helped him receive the Holy Spirit," said Farhadov. "Actually, it was really neat because I used to watch stories about Saeed on Christian World News and to know that we played a small part in Saeed's story is a real blessing." Days after their arrest in June, Alexander Neretin, a Russian pastor, started to campaign for the men's release. "We appealed to different humanitarian organizations, human rights organizations, Christian organizations and even non-Christian organizations," said Neretin. Churches across Azerbaijan and in neighboring countries also joined in to try help set the men free. "Actually, for nearly two months, we prayed 24-hours a day for our brothers in Iran. Everybody was so eager to pray." Then in what Neretin says was nothing short of a miracle, Iranian authorities decided to allow the men to return to Azerbaijan on bail. 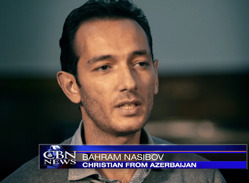 "We are so thankful to those who prayed for us and helped to raise the bail money," Gurbanov told CBN News. "This could have happened to anyone, we are not special, but people reached out to us and that means a lot." Their case is still pending. While the three will probably never be allowed to travel to Iran again, they said the ordeal has done little to dampen their passion to share Christ's love with others. This is only the beginning for me," exclaimed a confident Nasibov. "There are people in the world who are waiting for me to come tell them about Jesus. I am ready and I am not afraid." Farhadov said the experience was anything but easy. "Still I'm thankful to God for the privilege I had to be a part of His work and in a small way to suffer for the name of Christ."